This ball is afraid of nothing. 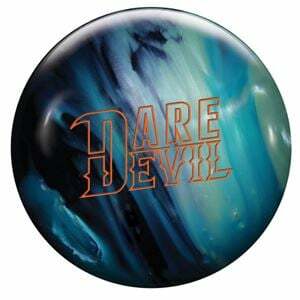 The Roto Grip Dare Devil takes ball reaction to the limit. It's unusual that a company is able to bring an entirely new ball motion to their line, but Roto Grip has done just that with the Dare Devil. The new low RG Madcap symmetric core is the engine that creates the drive you'll see on the backend. Paired with the Amped pearl coverstock, you're going to see amazing length with crazy, controllable backend hook. This will reduce over/under and make the Dare Devil a ball that excels on tough oil patterns. This ultra-low RG symmetrical Madcap core (2.47) with medium high differential (.040) looks to be a staple in the Roto Grip line for years to come. The Amped pearl coverstock delivers enhanced mid-lane and down lane motion.